Elisabeth Murdoch College is located in the south eastern suburb of Langwarrin. With a current student population of 1719, enrolment numbers are now consistent following a period of continuous growth over consecutive years. The College is positioned as the first choice for local families. An enrolment zone is in place and has been enforced to manage the growth. The 2016-19 Strategic Plan (and AIP) is focused on improving literacy and numeracy outcomes, building teacher capacity and building a positive education focus. Along with the three other government schools in Langwarrin we are a member of the Langwarrin Positive Education Network (THRIVE), which is part of the College’s emphasis on student and staff wellbeing. In our second year as a member of the University of Melbourne, Network of Schools (UMNOS) we are collaborating with a number of other schools focusing on improving writing outcomes. This work has already created improved results as evidenced by 2017 NAPLAN results. The College offers a learning environment that is purposeful and supported so that all students can achieve their best and be positioned for a positive future. Pride, building constructive relationships, challenging learning and community contribution are the core values that guide our work. Students are encouraged to aim high in all aspects of College life. Multiple national and international opportunities, e.g. Italian sister schools, Nepal community project, Yarrabah Project (Northern Queensland), performing arts Broadway Tour, overseas student exchange program, Central Australia tour and Tasmanian study tour. The College facilities are outstanding as is our teaching staff. We have invested heavily in the coaching space with all leaders trained to work with colleagues building capacity. We have developed strong connections with our feeder primary schools resulting in many opportunities being created for cross-sectoral learning experiences for all young people in the Langwarrin community. 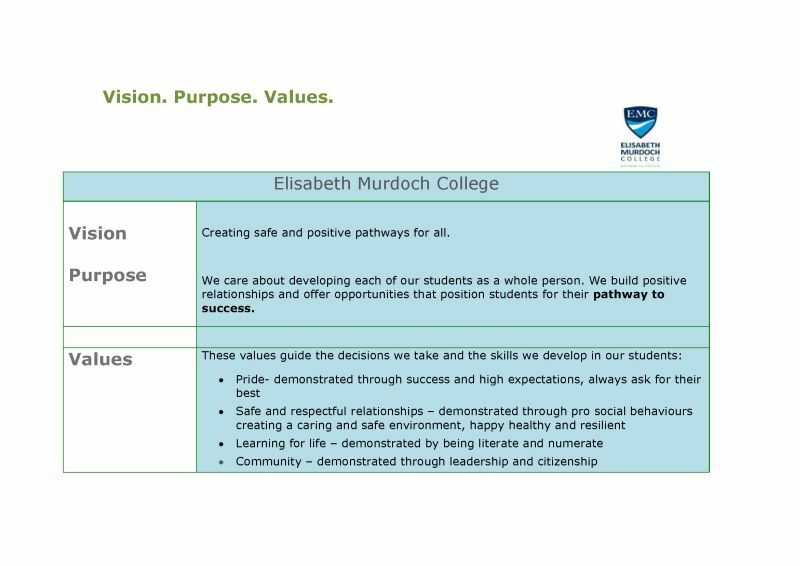 Elisabeth Murdoch College is focused on providing the best opportunities for all students and staff to identify their passions and excel in their chosen pursuits.